Yellow Hat lamasAll the Tibetan sects emerged from the Mahayana School of Buddhism, which is also the dominant form of Buddhism in China, Korea and Japan. Theravada (Hinayana) is the dominant school in southern India, Southeast Asia and Sri Lanka. The emergence and development of competing sects in Tibetan Buddhism is best viewed as a struggle between the clerical side of Buddhism, with its emphasis and textual study, and the Tantric side, which emphasizes shaman-style rituals and techniques. Each Tibetan sect addresses this struggle and in most cases emphasizes either the clerical side or the Tantric side over the other. All the different sects struggled for dominance as they emerged. But for the most part the ones that remain today complement one another; don’t compete and try to remain in harmony. All of the "Four Major Schools of Tibetan Buddhism" follow the core beliefs of Buddhism’s Four Noble Truths and other teachings. Each school traces its founding in Tibet to a particular person, who in turn is connected to a particular tradition in India. There are four principal schools within modern Tibetan Buddhism: 1) Nyingmapa founded by Padmasambhava, 2) Kagyupa, founded by Tilopa (988-1069), 3) Sakyapa created by Gonchok Gyelpo (1034-1102) and his son Gunga Nyingpo (1092-1158), 4) Gelugpa (The Virtuous School, Yellow Hat) founded by Tsong Khapa Lobsang Drakpa (also called Je Rinpoche) (1357 - 1419) and headed by the Dalai Lama. The Nyingmapa Order is the oldest, dating back to the 8th century. The Kagyupa order and the Sakyapa order emerged around the same time in the 11th century. 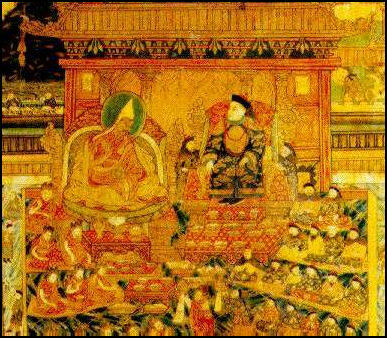 The Gelugpa (Yellow Hat) order emerged in the 15th century as a purer form of Buddhism at a time when the other sects were regarded as corrupt. It became the dominant sect in the 17th century. The previously thought-to-be-defunct Tibetan Buddhist school of Jonang turns out to be very much alive in Dzamthang. The Gelugpa order is often called the Yellow Hat sect while the Kagyupa is called the White Hat or Red Hat sect. The hats refer to the elaborate crescent-shaped hats worn by followers during ceremonies. The Chinese originated the terms to help them sort out the different sects in easy-to-remember terms, the same reason the terms are widely used by foreigners today. Sometimes the Red Hat term is used to describe all non-Yellow Hat sects. The term Black Hats refers to the Karma Kagyupa, a suborder of the Kagyupa sect. This is because the leader of the Karma Kagyupa, the Karmapa Lama, is often referred to as the Black-Hat Lama because that is the color of his ceremonial hat. In the 11th century Tibetan Buddhism became stronger and more politicized. The power of the ruling monks increased and the religion splintered into several sects. This period was marked by fierce rivalry between sects: first between the Kagyupa order established by Milarepa (1040-1123) and the Sakyapa order which emerged in 1073 from the Sakya monastery, a monastery funded by the Kon family, and later between Yellow, Red and Black Hat sects. In the 13th century, with the help of Mongolian supporters, the Sakyapa sect took control of much of Tibet. The Mongols under Genghis Khan had raided Tibet but converted to Tibetan Buddhism after a meeting between Genghis Khan’s grandson, Kokonor, and the head of the Sakya monastery. Sakyapa rule lasted for about 100 years. Three secular dynasties---the Phgmogru, the Ripung and the Tsangpa---followed between the years 1354 and 1642, when the Yellow Hat (Gelugpa) sect emerged as the dominant order. Fifth Dalai Lama The Yellow Hats (Gelupa) emerged in the 15th century. They were given a big boost in the 16th century when the Mongols decided to support them. The sect became preeminent in the middle of the 17th century, through the efforts of Mongolian supporters and Tibetan supporters inspired by the charismatic 5th Dalai Lama. The Yellow Hats took control of the central plateau and maintained control until British and Chinese incursions into Tibet in 19th century. The 5th Dalai Lama, Ngawang Lobsang Gyatso (1617-82) is regarded as the greatest of the Dalai Lamas. Born in Chongye in the Yarlung Valley, he unified Tibet and set the precedent for future Dalai Lamas. He was the first Dalai Lama to exercise temporal power and ruled benevolently as both a spiritual and political leader and initiated construction of the Potala palace. In paintings he wears a yellow hat and holds a thunderbolt in his right hand and a bell in his left hand. He is sometimes shown holding a lotus flower, a Wheel of Law or another sacred object. Nyingmapa (or Nyingma) is the oldest of the Tibetan Buddhist schools and the second largest school of Tibetan Buddhism. The Nyingma school is based primarily on the teachings of Padmasambhava, called Guru Rinpoche, "Beloved Master," who is the founder of Nyingmapa and revered by the Nyingma school as the "second Buddha." Featured Nyingmapa monasteries in Tibet include: Samye Monastery, Mindroling Monastery and Dorje Drak Monastery. Sometimes referred to among Tibetans as the Old School, the Nyingmapa Order was surpassed by the other major orders in the 11th century and remained in villages under shaman-like figures until the rebirth of Buddhism, also in the 11th century, when it experienced a revival after the “discovery” of hidden texts and “power places” visited by Guru Rinpoche revealed in Tantric visions by Nyingmapa masters.The Nyingmapa Order was never centralized and organized to the extent of the others and was considered too extremist. The Nyingmapa order was given a lift by the 5th Dalai Lama, who encouraged the expansion of the Mindroling and Dorje Drak monasteries, in U, which became the main Nyingmapa monasteries. The Nyingmapa Order places great importance on the Dzogchen, or Great Perfection, teachings, which deeply influenced the other sects but is largely sneered at by them today. Dzogchen philosophy argues that there was a state of purity that existed at the beginning of time that pre-dated the duality of enlightenment and earthly living and this offers a Tantric shortcut to nirvana. 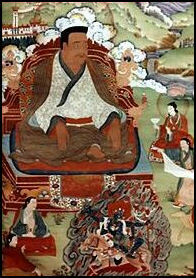 Padmascambhava's system of Vajrayana or Tantric Buddhism was synthesized by Longchenpa in the 14th century. Along with tantric practices, Nyingma emphasizes revealed teachings attributed to Padmasambhava plus the "great completion" or Dzogchen doctrines, also known as ati-yoga (extraordinary yoga). It also makes wide use of shamanistic practices and local divinities borrowed from the indigenous, pre-Buddhist Bon religion. Nyingma monks are not generally required to be celibate. The most recent head of the Nyingma tradition was Mindrolling Trichen, who died in 2008. A successor has not been named. Marpa Kagyupa is the third largest school of Tibetan Buddhism. Its teachings were brought to Tibet by Marpa the Translator, an 11th century Tibetan householder who traveled to India to study under the master yogin Naropa and gather Buddhist scriptures. Marpa's most important student was Milarepa, to whom Marpa passed on his teachings only after subjecting him to trials of the utmost difficulty. 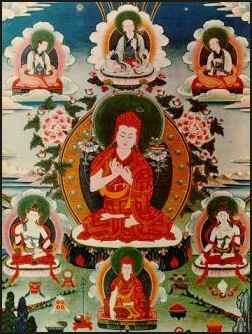 In the 12th century, the physician Gampopa synthesized the teachings of Marpa and Milarepa into an independent school. As its name indicates, this school of Tibetan Buddhism places particular value on the transmission of teachings from teacher to disciple. It also stresses the more severe practices of hatha yoga. The central teaching is the "great seal" (mahamudra), which is a realization of emptiness, freedom from samsara and the inspearability of these two. The basic practice of mahamudra is "dwelling in peace," and it has thus been called the "Tibetan Zen." Also central to the Kagyupa schools are the Six Doctrines of Naropa (Naro Chödrug), which are meditation techniques that partially coincide with the teachings of the Tibetan Book of the Dead. The Kagyupa tradition is headed by the Karmapa Lama. The current head is the Seventeenth Gyalwa Karmapa, Ogyen Trinley Dorje, who was born in 1985 in the Lhathok region of Tibet. Important Kagyupa teachers include Naropa, Marpa, and Milarepa. Some accounts name Marpa "The Translator" (1012-1099) as the founder of the Kagyu school, while other accounts name as the founder Gampopa (1084-1161), also known as Dagpo Lhaje, who was a student of Marpa's disciple Milarepa. Kagyu is best known for its system of meditation and practice called Mahamudra. < Kagyupa (“Whispered Transmission”) order traces its origin back to Marpa (1012-1123), a married Tibetan yogi famous for his Tantric power, and Milarepa (1040-1123). One of Milarepa’s disciples, Gampopa (1079-1153) established a number of monasteries. The Kagyupa order initially emphasized the Tantric side of Tibetan Buddhism over the clerical, textual side. As it became more organized it emphasized the textual, clerical side more and became hierarchal, and at this stage was accused of placing to much power in the hands of lamas and being corrupt Over time several Kagyupa suborders emerged. The most well known of these is the Karma Kagyupa (see Below). Others include the Drigungpa and Taglungpa sects, which are based respectively at the Drigung Til and Talung Monasteries in U. The Black Hat sect is properly known as Kagyu Karma or Karmapa. It is a suborder of the Kagyupa (Red Hat) order and is led by the Karmapa Lama. It was once Tibet's most politically powerful sect but it was supplanted by the Yellow Hats of the Dalai Lama 350 years ago. The Kagyo Karma order is credited with inaugurating the tradition of passing on leadership through the reincarnations of lamas when Dusim Khyenpa (1110-93), the abbot of Tsurphu Monastery, announced he would keep his position after death in a reincarnated form as someone else. The Black Crown is the symbol of authority of the Karmapa Lama. Said to have been woven from the hair of female angels, it was presented to the 5th Karmapa by the Chinese emperor Yong-le in the 15th century. The 16th Karmapa Lama deposited it at Rumtek Monestray in Sikkim. Sakya Pandita Sakyapa is today the smallest of the four schools of Tibetan Buddhism. It is named for the Sakya ("Gray Earth") monastery in sourthern Tibet. In 1073, Khon Konchok Gyelpo (1034-l102) built Sakya Monastery in southern Tibet. His son and successor, Sakya Kunga Nyingpo, founded the Sakya sect. The abbots in the Sakya Monastery were devoted to the transmission of a cycle of Vajrayana central teaching and practice called Lamdrey, or "path and goal", the systemization of Tantric teachings, and Buddhist logic. < The Sakyapa Order emerged in the 11th and 12th centuries at monasteries where Indian Buddhist texts were being studied and translated into Tibetan. Its most well known figure was Kunga Pandita (1182-1251), who is often called Sakya Pandita (literally “Scholar for Sakya”). Regarded as manifestation of Jampelyang (Manjushri), the Bodhisattva of Insight, he served as a spiritual advisor for Kublai Khan and was involved in Chinese, Tibetan and Mongol politics. The Sakyapa Order emphasizes the clerical-textual side of Tibetan Buddhism over Tantrism. It has largely been overshadowed by the Yellow Hat and Red Hat orders but remains alive today. Important Sakyapa lamas include Sakya Trizin, Ngawang Kunga, (head of the Sakyapa order), Chigye Trichen Rinpoche (head of the Tsarpa suborder) and Ludhing Khenpo Rnpoche (head of the Ngorpa suborder). The Sakyapa Order established a number of monasteries that stressed the study of Buddhist scriptures. Among those who studied there was Tsongkhapa, the founder of the Gelugpa (Yellow Hat) sect. The Gelugpa (Yellow Hat) order is the youngest school of Tibetan Buddhism, but is today the largest and the most important. It is lead by the Dalai Lama and was founded by Tsongkhapa (1357-1419), a lama who established a monastery at Ganden. Tsongkhapa attracted a number of followers who were disgusted by the corrupt rule of the Sakyapa and Kagyupa orders. After his death his followers established more monasteries and their movement came to be called the Gelugpa (“Virtuous”) order and the their leaders, the Dalai Lama. Featured Gelugpa monasteries in Tibet include: Drepung Monastery, Sera Monastery, Ganden Monastery, Tashilunpo Monastery. Gelugpa practices are centered on achieving concentration through meditation and arousing the bodhisattva within. Three large monasteries were quickly established near Lhasa: at Dga'ldan (Ganden) in 1409, 'Bras-spungs (Drepung) in 1416, and Se-ra in 1419. The abbots of the 'Bras-spungs monastery first received the title Dalai Lama in 1578. The Gelugpa school has held political leadership of Tibet since the Dalai Lamas were made heads of state by the Mongol leader Güüshi Khan in 1642. The Yellow Hats have dominated Tibetan Buddhism since the 17th century, when they pushed their rivals, the Black Hats, from power with the help of a Mongol prince. The Mongols coined the name Dalai Lama and helped the Yellow Hats gain dominance over the their rivals. The Red Hats have also traditionally been rivals of the Yellow Hats. 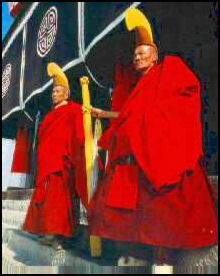 The yellow hats are worn with red robes by monks during religious ceremonies. The hats look like large yellow bird claws or crescent moons and are worn with the concave side facing forward. Tsong Kapa Tsongkhapa (1357-1419) is the founder of the Yellow Hat order. He was a reformist monk who preached monastic discipline and doctrinal purity and called for a return to conservative doctrines. He called for stricter rules that prohibited monks from getting married (some did before then) and drinking wine. Tsongkhapa is one of Tibet's greatest scholars. He "enforced strict monastic discipline, restored celibacy and the prohibition of alcohol and meat, established a higher standard of learning for monks, and, while continuing to respect the Vajrayana tradition of esotericism that was prevalent in Tibet, allowed Tantric and magical rites only in moderation." The first Gelug monastery, Ganden, was also built by Tsongkhapa in 1409. Tsongkhapa is regarded as a manifestation of Jampelyan (Manjushri), the Bodhisattva of Wisdom. In paintings he is usually pictured with a yellow hat, holding two lotus flowers with his hands in the “teaching” mudra. He is often portrayed in a triad with his two main disciples, Kenrud Je and Gyastab Je. Tsongkapa was born in Kokonor near present-day Xining in Qinghai Province. He left home at 17 and studied at all the major schools that existed in his time, but was particularly taken by the Sakyapa and Kadampa orders. The Yellow Hat sect emphasizes the scholarly approach to Buddhism and advocates following the traditional monastic code as a means of reaching nirvana. The Yellow Hats are regarded as a strict sect. Their monks are known for their martial arts skills. By contrast its main rivals, the Red Hat sect, emphasize a more Tantric approach. Some have compared the Yellow Hats to Catholics and the Red Hats to Calvinists because the Yellow Hats donned colorful robes, lived in grand palaces, conducted elaborate ceremonies and put a great emphasis on following religious doctrines and texta like the Catholics while Red Hats are austere and mystical and look to the inner self rather than doctrines and books for answers. The Yellow Hats are greatly influenced by the teachings of Atisha. They merged Mahayana doctrine with Tantric practices, while emphasizing scholarly study. The group does not condemn Tantric practices but argues that they take years to master and should not be viewed merely as shortcuts to enlightenment and nirvana. Some Yellow Hat Tibetan Buddhists, known as Shungdens, revere an avenging angel called Dorje Shugden. Mainstream Tibetan Buddhists and the Dalai Lama regard them as cultish and divisive. Shugden worship is particularly big around Litang. The Shugdens have been called the Taliban of Tibetan Buddhism because of their extreme views. Dorje Shugden is regarded as a vengeful protector god. He is often depicted as a sword-wielding warrior who wears a necklace of human heads and rides a snow lion through boiling blood. The Dalai Lama has been trying to discourage worship of Dorje Shugden since he first appeared in the 1600s. Dorje Shugden is the renamed spirit of Tukla Dragpa Gyaltsen, a powerful 17th-century monk who challenged the 5th Dalai Lama and was murdered’suffocated to death by having ceremonial silk scarves stuffed down his throat---in his palace in 1656 by a close aide of the Dalai Lama. The name Dorge Shugen ("hurler of thunderbolts")---is reference to his great power. A senior monk named Kelsang Gyatso established a new Dorje Shugden order in England in 1991 and called it the New Kadampa Tradition (NKT). Followers of this sect believe that the Dalai Lama is a traitor for being too compromising with China and too friendly with the Red Hat sect (the Shugdens consider it a sin to talk to members of the Red Hat sect or touch their religious objects). In 1996, the Dalai Lama denounced the NKT of being a dangerous and greedy commercial cult and warned followers of Tibetan Buddhism to stay clear of them. Two decades earlier he stop praying to the spirit of Dorje Shugden because he believed its negative energy worked against him and he was told by the oracle that Shugden was really an "evil spirit." The NKT is believed to be behind the murder of close associates of the Dalai Lama (SEE Above). Police believe the Dalai Lama’s condemnation of the NKT may have been the motive for the murder. The NKT has also been accused of bilking its followers out of large amounts of money. One of it newsletters told followers" "if you are in the market for some merit (and who isn't) here is a perfect opportunity” and then said buying a $4,800 NKT shrine cabinet, $3,200 NKT Buddha statue and a $48 tea-cup and saucer with mark of a senior monk were easy ways in which people could earn lots of merit..
Serthar (Sertar)---a place in the remote, barren 13,000-foot-high Larung valley in the Tibetan region of western Sichuan---is the home of a unique Buddhist community. Founded in 1980 by Khenpo Jigme Phuntsog, who claims to be a reincarnation of the teacher of the previous Dalai Lama, the community boasted 10,000 followers who lived in spartan log cabins and mud huts, making it the largest group of its kind in the Tibetan regions. Most of the members were Tibetans but there were 1,000 ethnic Chinese members in the group. The community was called Larung Gar (Gars means encampment) and Serthar Buddhist Institute. Located near the border with Tibet and Qinghai Province and 500 miles from the nearest city, it was surrounded by towering mountains and reached by dirt road Before the Buddhists arrived no one lived in the valley. Larung was not a monastery. Its members included nuns, red-robed monks, scholars and laymen and women. It was not associated with any of the Tibetan sects. Doctrines from all three of the major Tibetan Buddhist sects are taught. The group was tolerated for while because Jigme Phuntosg went out of his way not to do anything to offend Beijing. Even so the "evil cult" law passed to combat Falun Gong in 2000 was used to crack down on the group, because it had grown so large and was perceived as a threat. In 2001, armed police evicted hundreds of Tibetan nuns, monks and scholars from the Serthar. Houses were burned down and people who were evicted were forced to sign documents denouncing the Dalai Lama and threatened with arrest if they returned. Some nuns threatened to commit suicide rather than leave. The aim was not to close the community but to limit its size. See Places. After the crackdown the community managed to survive. Many monks who were ordered to leave simply walked down te road and turned around and returned, sneaking past police. Members seemed to not care about the risks. After the crack down new members showed up. Their resistance called into question Beijing’s ability to crush religious and dissident groups. As of early 2004, there were about 3,000 people at Serthar. Jogme Phuntsok continued to meet with small groups of students until his death in January 2004.